The BedRug Impact Bed Liner offers a unique combination of the Impact Bed Mat and BedRug Full Bed Liner. 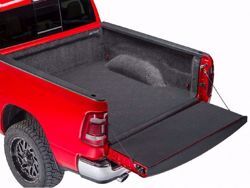 The bed mat section that protects the bottom of the truck's bed along with the tailgate is made from the same TPO construction as the Impact bed mat, while the side walls are made from polypropylene like the BedRug Full Bed Liner. The TPO liner adds a sleek, spray-in liner look while the sides have a plush padded look. This rugged bed liner is bonded to a 3/4" polypropylene foam backing to provide great impact resistance to protect the truck bed, your cargo, and your knees when climbing in and out of the truck. 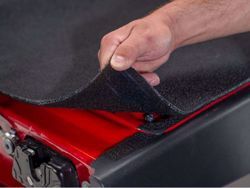 This closed cell foam backing is non-abrasive and will not affect the finish of the truck's bed. The Impact Bed Liner helps keep cargo from sliding around the bed and the integrated tailgate gap guard prevents dirt and debris from getting in. The entire liner is UV resistant and is tough enough to withstand chemicals like bleach, gas, and battery acid. The Impact Liner is easily cleaned with a hose, and will not mold or mildew. These bed liners offer a quick and easy installation and can quickly be removed to clean between the bed and mat. 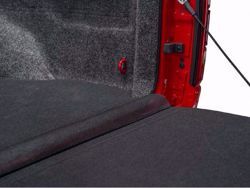 The standard mat attaches with 3M hook and loop fasteners. The BedRug Impact Liner is backed by a lifetime warranty and made in the USA, so buy with confidence knowing this product is made to last.